Hot Lava Java Handled Coffee Mug BA732 Free Shipping. #BA732 Hot Lava Java Handled Coffee Mug. 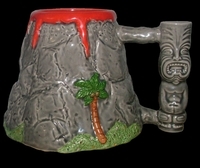 Start your morning off with a bang of Volcanic proportions with our Hot Lava Java Coffee Mug! Handle features a double-sided smiling/frowning Tiki. This is no whipmy coffee mug either. It measures 4 1/2" in height and holds 19 oz. Designed by Squid.